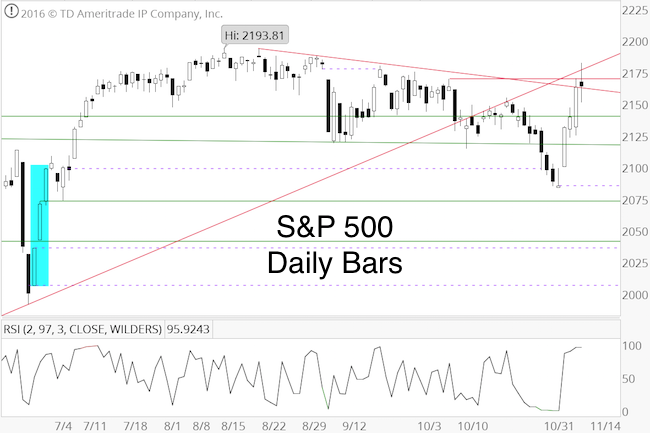 S&P 500 Update – Expect the Abnormal? Last week the S&P 500 almost reached the year-end target (2,220) given by the Profit Radar Report back in January. What’s next? The S&P 500 is up 130 points since the beginning of the month, S&P 500 futures soared as much as 183 points. Stocks are overbought, and under normal circumstances there should be a noteworthy pullback. But there is reason to expect the abnormal. The August 28 Profit Radar Report published an uber-bullish Elliott Wave Theory-based projection. The Profit Radar Report’s forecasts are always built on multiple indicators, and this bullish projection was confirmed by liquidity, long-term investor sentiment and bullish year-end seasonality. We never rely unduly on any one single indicator. 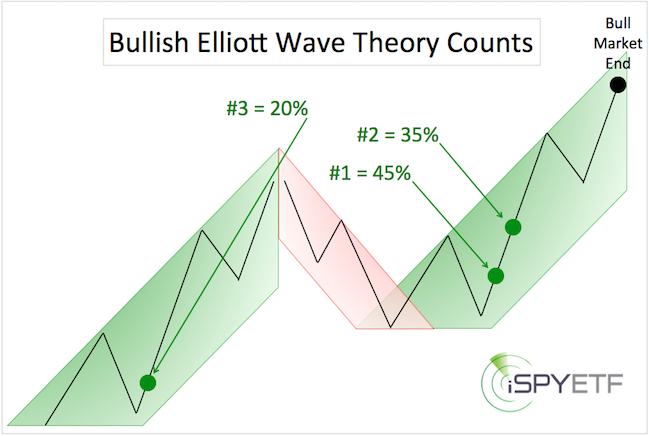 It is noteworthy however, that the three most likely Elliott Wave Theory (EWT) interpretations are all bullish. The degree of bullishness varies, but according to EWT, more gains are ahead. The question is not if, but how much and for how long. The first chart below shows conceptually where the S&P 500 is at relative to the three most likely EWT options along with the odds for each scenario. The second chart provides a more detailed (yet basic) outline/labeling of EWT counts #1 (45% probability – light green) and #2 (35% probability – dark green). What we are focused on for now is the most likely scope of any pullback. The down side risk for #1 is larger (around S&P 2,130 – 2,070 – see light green square) than for #2 (around S&P 2,150 – 2,130 – see dark green square). No further detail is shown for the most bullish option, #3 which would translate into a few more years of bull market. At this point, we discount #3 (20% probability) because some cycles point to prolonged weakness starting in H2 2017. 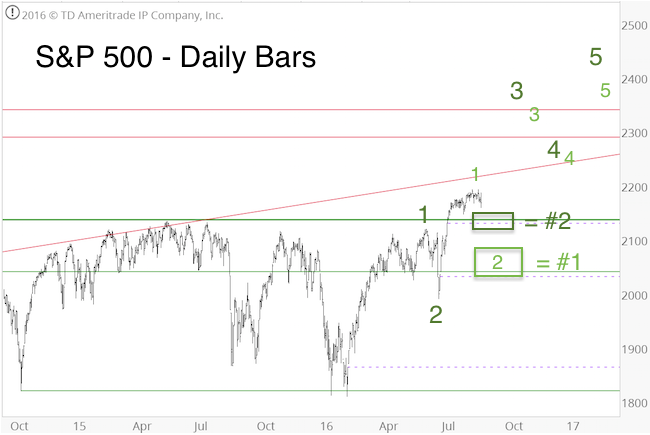 The anticipated pullback drew the S&P 500 to 2,084 (right inside the first target zone). Stocks haven’t looked back since. Unless you’re already on the bus, a momentum driven market is one of the hardest markets to get in (like jumping onto a moving bus), because it rarely stops. At some point momentum will halt (which is sometimes followed by a nasty correction), but the question is when? The chart suggests to watch support at 2,190 – 2,200 (if lucky, we may even see 2,170 – 2,150). Waves 3 (according to EWT) are generally strong and relentless moves. Stocks appear to be in such a third wave advance. Many investors consider EWT hocus-pocus, and I can understand way. I’ve seen many horrid EWT interpretations cost investors a ton of money. That’s why the Profit Radar Report never relies on any one single indicator. As of right now, the weight of evidence (not just EWT) points towards higher prices (with or without prior pullback). We go where the indicators take us. Back in January, when the S&P traded below 1,900, our year-end target of 2,220 seemed outrageously bullish. As it turns out, it actually may not have been bullish enough. Continuous updates with actual buy/sell recommendation (which help balance down side risk with the risk of missing out on the up side) are available via the Profit Radar Report. 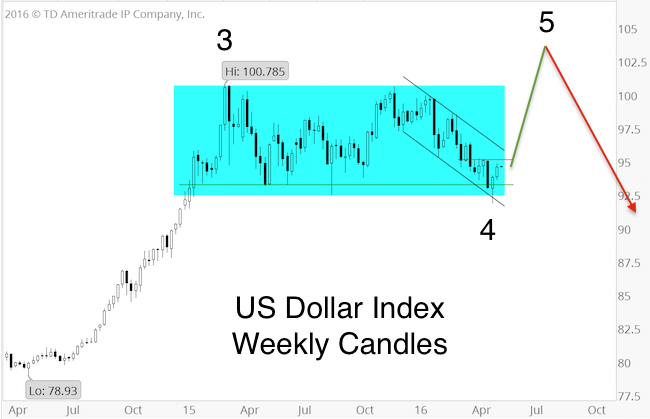 US Dollar: How Big is the Risk of a Triple Top? 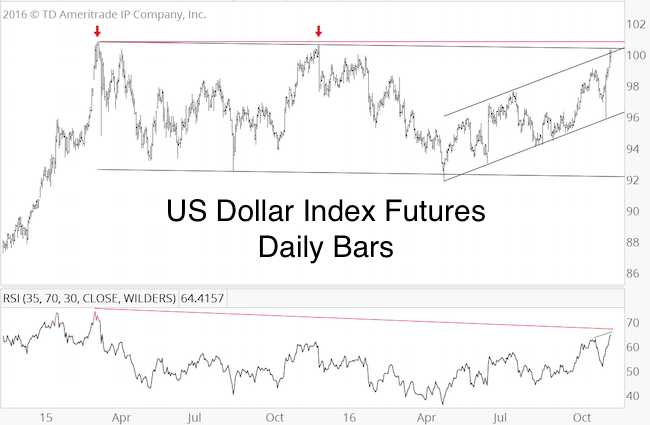 For the third time in 2016, the US Dollar and US Dollar Index Futures are above 100, and the PowerShares DB Bullish US Dollar ETF (UUP) is near 26. How big is the risk of a triple top? The US Dollar has now come within tics of new recovery highs. There are various resistance levels at 100 – 101 along with a longer-term RSI divergence. Short-term, RSI confirmed the recent price high. In terms of seasonality, late November/December is one of the most bearish times of the year. As illustrated by the original projection, this rally is a fifth wave. This means that the end of this rally will be followed by a sizeable correction. Although the US Dollar may have further up side, risk is rising. Continuous updates for the US Dollar, EUR/USD, stocks, gold, silver and other asset classes or sectors is available via the Profit Radar Report. 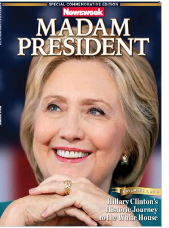 Were you able to get one of the special edition “Madam President” Newsweek issues? That’s right, Newsweek printed and delivered newspapers featuring Hillary Clinton as president elect. “Like everybody else, we got it wrong,” said the CEO in charge of this mishap. This is the second time in 2016 that media and market pundits got blind sighted and fooled by a big event. As the above two examples show, the market rarely follows the expected path. Stock futures suffered a brief panic selloff on Tuesday night (S&P 500 futures were down as much as 120 points), but quickly recovered. The VIX has lost over 50% in the past few days. 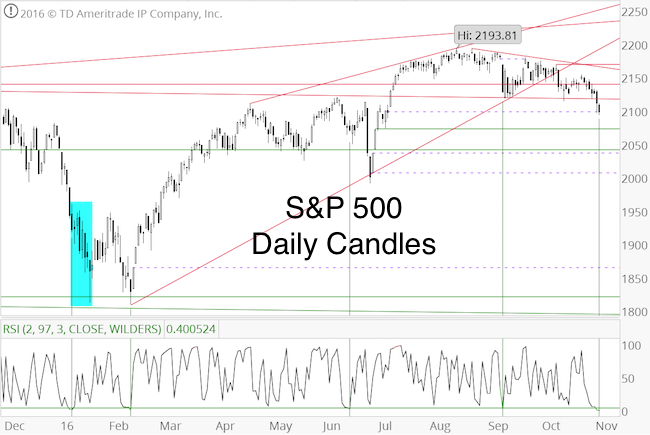 It’s hard to believe that the S&P 500 cash index (unlike the S&P 500 futures) remainded above support identified last week and reacted immediately to the oversold condition and bullish divergences. Short-term, the S&P 500 is butting against triple resistance while overbought. In addition, the days following the election tend to show some weakness. Longer-term, there are a number of bullish forces which should push stocks through resistance. The correction we expected last month reached our down side target (reason for correction and down side targets are shown here). The tailwind of two breadth thrust in 2016 bodes well for stocks (detailed breadth thrust analysis with implications is available here). VIX seasonality is bearish for the coming weeks. XIV is up 8% since we last recommended it (after closing a 14% XIV gain in September). Here is why we like the XIV trade. The Profit Radar Reports up side target may be surprising to many, but it is strictly indicator based. At this point, only one ingredient is missing to unlock higher price targets. Up side targets, the missing ingredient, and continuous indicator-based S&P 500 analysis are available via the Profit Radar Report. Although we are longer-term bullish, we expected lower prices prior to a buying opportunity. 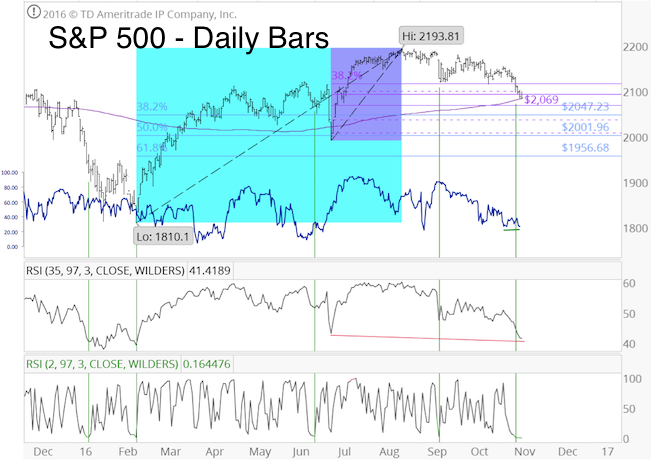 The last S&P 500 update highlighted lacking up side momentum and bearish divergences … which caught up with stocks this week. Why 2,100? An open chart gap at 2,098.70 has been waiting to get filled (dashed purple line). The emphasis is on quick. On Wednesday the S&P failed to build on the initial recovery from Monday’s lows (right after the open chart gap was closed). 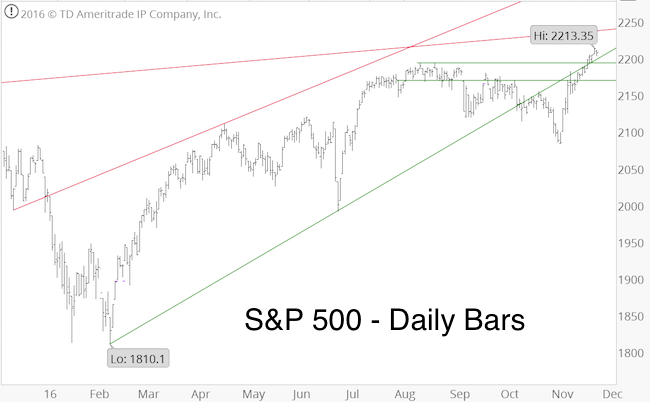 While the S&P maintains below resistance (prior support), it’s at risk to fall further. As green lines in the first chart show, the S&P 500 is oversold (based on RSI-2). Oversold conditions have led to bounces 3 out of 4 times in 2016 (the one failure is highlighted in blue). The market is not only oversold, it is also overhated. The second chart shows that various sentiment metrics are nearing noteable extremes. VIX traders believe that longer-term volatility (90 days, VXV) will be higher than shorter-term volatility (30 days, VIX). The VIX/VXV ratio is above 1 for the first time since the Brexit vote. 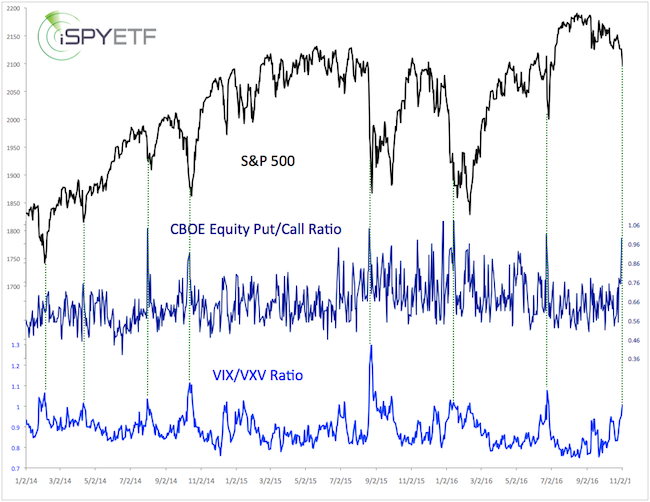 Also for the first time since the Brexit vote, option traders are nearly buying as many puts as calls The CBOE put/call ratio is one of the highest we’ve seen in the past few years. History says that the best opportunities are born in times of panic. Where is maximum panic? In January the S&P continued temporarily lower despite being oversold and overhated, but eventually rebounded strongly. The more panic, the better the opportunity. It’s risky to short such a market, and much more promising to look for a low-risk buying opportunity. 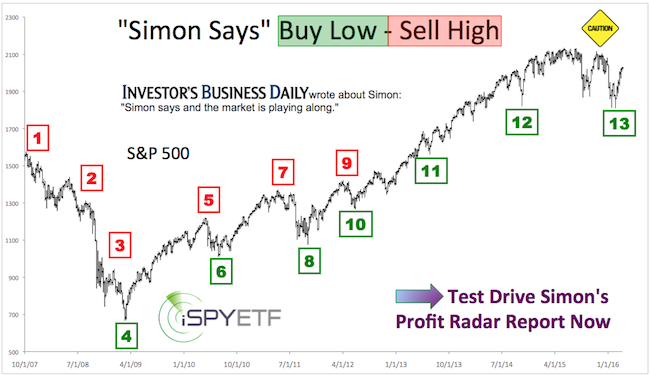 The Profit Radar Report nailed the February low (buy recommendation at S&P 1,828 on February 11) and we will try to do the same for the up coming low. Our focus in the coming days/weeks will be to minimize short-term down side risk without missing the lowest possible entry point to buy. Continued S&P 500 updates and buy/sell recommendations are available via the Profit Radar Report. The S&P 500 is trading at the same level where it was on July 8. Such a 15-week chop zone is pretty boring, but it doesn’t stop there. The S&P hasn’t made any net progress since May 2015. When the broad market is stale, it makes sense to look at other opportunities. The Profit Radar Report always scans various markets and sectors for sentiment extremes or seasonal trades with the potential to provide returns independent of the broad market. Thus far this year, we’ve found such returns in gold, silver, natural gas, small caps, VIX and the utility sector. The October 12 Profit Radar Report pointed out that every single utility sector stock has been below its 50-day SMA for more than five days. An extremely rare oversold condition. We didn’t want to chase the S&P 500 when it bounced from its 2,120 support level on October 13, but wanted some low-risk exposure to equities. 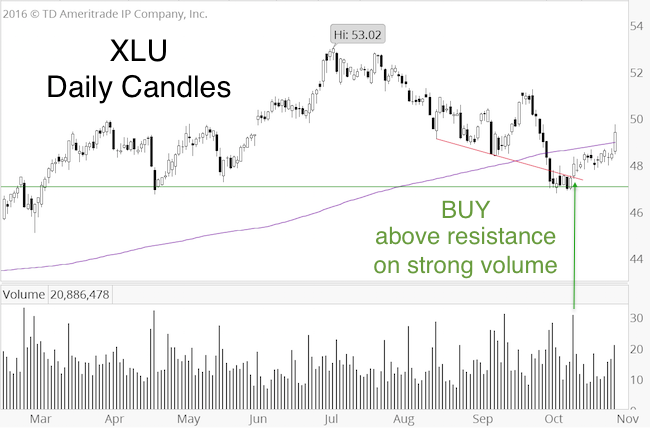 Being oversold and overhated, XLU fit the bill. The banking sector is approaching a very strong resistance cluster. 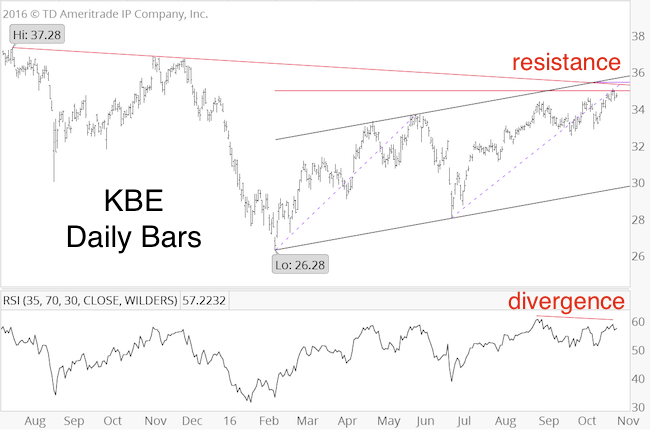 The chart of the SPDR S&P Bank ETF (KBE) shows price near trend line resistance, 78.6% Fibonacci retracement, and where wave A equals wave C.
Additionally, there was a bearish RSI divergence at the October 27 high. Seasonality is bearish for the first three weeks of November. This doesn’t mean that bank stocks will crash, but it certainly indicates that buying KBE right around 35 is a bad idea. There is no short bank ETF, but traders may consider shorting KBE or buying inverse ETFs like SEF or SKF. This setup may only lead to a short-term correction.